Boundary of buried crater rim and mare basalt at Flamsteed P crater. Illumination is from right, incidence angle is 60°, image width is 500 meters. This image displays a portion of eastern rim of Flamsteed P crater, located in southern Oceanus Procellarum. The rough and darker right side corresponds to the rim slope, and the brighter and smoother area to the left is the younger mare basalt. Flamsteed P's interior was mostly filled by mare basalts and all that remains are portions of its rim showing as discontinuous ridges (see WAC context image below). In terms of local timeline of events (geochronology), following the formation of Flamsteed P, mare basalt flooded its interior and exterior. 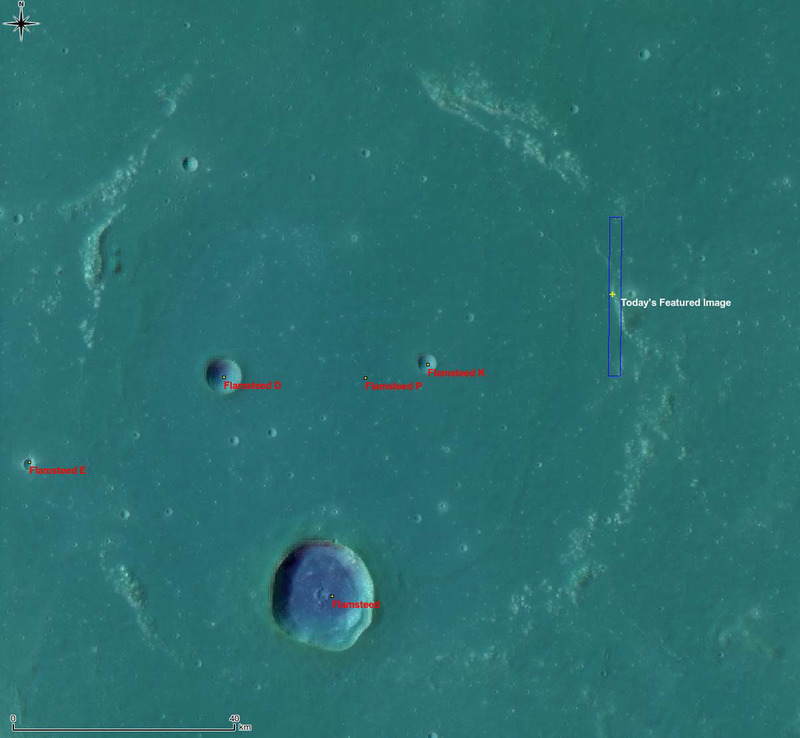 Later a small crater (110 meters diameter) formed just at the boundary between the mare and crater rim (bottom of today's Featured Image). This small crater is half covered by the older rim unit. Does this make sense? 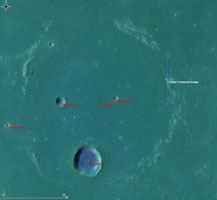 Even though the small crater is much younger than the Flamsteed P rim it is buried by rim materials that slid downhill after the crater formed. What cause the regolith to move? Perhaps moonquakes generated by internal stresses or nearby impact events. Or, perhaps a slower process of downhil creep caused by thermal cycling of the regolith (soil). We have much to learn about the Moon -- the next frontier.